November 2005. Once again I found myself in the Amazon Jungle, having traversed land, air and river to arrive in the midst of a paradisiacal world of flowers and birds indistinguishable in color, river water the color of a latte’ and the clothes of the Shipibo Indians embroidered and painted with the visionary patterns of the sacred vine of the Soul, Ayahuasca. The cast of characters is familiar: Alan, our ever-smiling travel guide, and a true friend indeed. Gilber, our Mestizo boatman and his son-in-law Roberto guide the riverboat Normita easily and confidently through the riverways and channels between the green, green banks that unfold on either side of us, peeling away from one scene to the next. Shipibo villages, plantations of banana, mango, papaya, corn, rice and coca slip past as we glide through the waters. Pink dolphins swim about us as egrets stand, one-legged, in the shallows, awaiting its dinner to swim past its long-necked beak as hawks sit silently in the trees, observing all that passes by their perch, like some silent witness to Creation. Buzzards swarm overhead, taking care of that which no longer moves. Carlos, the Ayahuascero who will guide us through our Ayuahuasca visionary experiences, has with him his wife, Angelina. She is to be found to be the embodiment of Mother; caring, warm and smiling, sincere and earnest in her every word, laughing freely and often. Both Gilber and Carlos have with them a few of their children and grandchildren. Family. We are embraced, we North Americans, as their own family, as indistinguishable from their own families as the colors of the birds and flowers are from one another. I am home. Camp is put together on the bank of the Ucayali River. Evening falls swiftly in the jungle, and comes alive with the buzz of insects and the strange-to-our-ears sounds of birds, monkeys and unknown exotic wildlife. A meal is offered, fish and rice and beans and bananas. Those of us about to partake in the night’s ceremony refrain from eating, choosing to keep our systems available for the sacred brew we are about to drink. A tent of mosquito netting is put up, tarps laid across the top in case of rain. The floor is laid with tarps, and then covered in soft sleeping pads, a pillow and blanket for each participant. Darkness falls and we are called to enter the tent. Carlos and Angelina and Gilber sit awaiting us. We are a group of peoples come, with respectful intent, to participate in this powerful and empowering ceremony that these ancient tribal peoples are making available to us, welcoming us into the inner secrets of their most potent Shamanic reality. Carlos opens the ceremony with a song, Angelina joins in. The sound of voices of these two people, bonded in life and spirit, create in and of themselves a mind-altering blanket of pleasure and safety. Gilber offers prayers for our benediction. The brew, the same color as the river water – a creamy brown – is poured by Carlos into a gourd, his keen eye measuring the dosage for each individual with the perceptual knowledge of experience. As instructed, we each set our intent as to the focus of our night’s journey, communing with our own Soul, speaking our truth as we know it, and listening to the response of our Soul informing us of our real needs. The needs of my life, as I see them, move forth into awareness. Health. Relationship. Spirit’s Calling. We drink the brew, bitter and thick. A slight impulse to heave comes and passes. That’s only normal. After we have each partaken, Carlos comes around to each and prays over us, blowing the thick pungent tobacco smoke of his pipe over our heads. A calming feeling immediately sweeps over me, washing away any residual trepidation and all is well. I am ready. Those of us who choose to pray with tobacco do so at this time. By the time our tobacco prayers are completed we are quite ready to lie down, as Carlos has instructed us. We arrange ourselves in the tent, getting comfortable in preparation for the next four hours of Ayahuasca journeying that is to follow. As the Ayahuasca takes affect I feel a shivering, not of cold, but of life-force swimming through my body. A slight giddiness washes over me and I know that the reason for my being here, deep in the Amazonian jungle, far from civilization, here with these wonderful Mestizo and Shipibo peoples and my fellow North American sojourners, is underway. It is not long before the wah-wah-wah-z-z-z-z are resonating through all my senses. Immediately my liver seizes in pain! Excruciating, body-doubling pain. I have not experienced this much pain in my liver since my two bouts with hepatitis when I was a young adult. This throbbing continues throughout the whole night, even amidst all the splendor and transformations and realizations that naturally come with an Ayahuasca experience, experiences that highlighted the measures necessary for me to release old patterns in relationships, and the on-the-spot transmutation of these old patterns of behavior. Deep and meaningful insights into the further direction of fulfilling my Spirit’s Calling were revealed, and implemented. Towards the end of the journey, some four hours later, the Spirit of Ayahuasca, the sacred serpent, appears to me and speaks, very directly: “This will be the cause of your early death.” I get it, really I do. I have had liver pain and distension every day of my adult life, ever since the hepatitis infections and a number of years of putting chemicals in my body that our organs are not designed to accommodate, Knowing the provocative nature of the Ayahausca, this information was not for naught, It was a declaration only if not received as a warning and relevant to my request for health. It was guidance towards resolve. I knew that I must avail myself of the next two nights to deal with this impending crisis in my health. Soon the Ayahuasca’s primary constituent, DMT, was reabsorbed into the body. DMT is an organic molecule that the brain naturally produces in dreaming, meditation, etc. By imbibing Ayahausca we are simply increasing the introduction of a naturally occurring compound into the brain, escalating the experience, while awake, that our pituitary gland provides for us already. We shifted into a smooth and easy transition back to the ‘normal’ world of the senses, drifting off to sleep shortly thereafter. With morning came breakfast. Ahh! Pineapples, mangoes, papaya, bananas, fresh-caught fish from the river, baked upon open coals, coffee and some of the finest company you could imagine. Bright and cheerful, we shared stories of our night’s journeys, laughed and lazed. Camp was packed back into the boat and we set forth once more. Miles and hours later we debarked at the second of our campsites, a place we would grow fond of during the next three days of living there. Rain threatened, so a substantial tarp-tent was set up on a rise inset from the river by fifty yards. Having still some time before the evening’s activities, the young women and children brought forth their wares: colorfully embroidered clothes and bags, seed-bead necklaces and bracelets, wooden pipes with monkey bone stems and mahogany dyed cotton broadcloth, painted with geometric patterns that we all immediately recognized from our experience of the night before. We whiled the time away perusing, buying, receiving and giving gifts, eating lightly, reading and chatting. We had quite the time, laughter all around, talking with the families. The Shipibo speak Spanish, more or less, as did most of us. 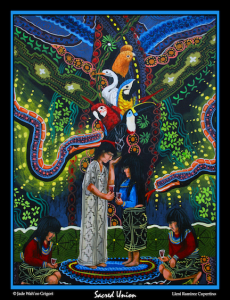 Gilber was a wonder in helping translate, as sometimes the Shipibo did not know how to express something in Spanish, something that was a concept unique to their world view, that only their own language could convey. Evening brought with it the deepening dusk, and with it, the voices of the eternal forest that surrounded us, embraced us in its touch. This night’s ceremonial proceeded much as the first, in preparation. Songs sung by Angelina, Carlos and Gilber carried us in our Ayahuasca Visions into realms of our deepest held grief and fears, soared us thence into the highest of vistas filled with light, color, celestial sounds, soothing sensations and ecstatic joy. Their icaros, spirit songs, have a magical quality that seems to be that effusive celestial light made tonal, slivers of crystal that shimmer in awareness, freeing one into bliss and a oneness with All Being. My own quest of healing the liver began in earnest once again, as it had come to hurt once again, soon after ingesting the Ayahuasca. Surrendering into the current of electric life that is released into awareness by the Great Mother Serpent, Yakumama, I was drawn into the realm of shimmering light, fractal rainbows and deeper, deeper into the weaving of manifest existence that underlies it all. I awoke within my own DNA. Amidst the spiraling ladder that twisted both up and down simultaneously, emitting sheer beams of light-encoded knowledge, songs of intense immensity, icaros in their own right. My attention was drawn to strands that were emitting dissonant frequencies, shrieking instead of singing. With a knowingness not guided by intellect I wove my awareness into the threads of light, reweaving the frayed strands, repairing broken bridges, making into wholeness that which had been damaged. As these DNA ropes wove into their original patterns, the job complete, the songs sung in beauty once again, I found myself flying, like a shooting star across the sky, back into 3-D substantiality. The pain in my liver, I noticed, was significantly reduced. The rest of the night passed rather peacefully, without any further flights of light, nor sojourns into the darkness. After a time my compadres began to shift their bodies around, some snoring, some quietly exchanging comments with those of us still awake. The night passed, dawn glowed, and we arose to a new day. The third day in camp was spent for the most part dozing in hammocks stretched between the grand banyan-like trees, whose limbs, upon touching the ground, took root and become a new trunk, some of these trees sprawled fifty feet across, a dense forest of their own making. Daily the monkey troupes leaped through overhead, chattering and calling to each other. Even in the rain the area beneath these trees remained relatively dry, so dense is their foliage and weaving of branches. After morning coffee and some fruit Carlos, an Elder of 65 years age, grabbed his machete and began to whack away at a stout limb of a nearby tree. He then trimmed it down and hefted it like a club. This is, indeed, exactly what it was. We were invited to observe him preparing a fresh batch of the Ayahuasca brew for that evenings imbibing. Showing us how to wield the club, and the method of smashing the sacred vine that is one of the two primary ingredients of the concoction we drank, he indicated that we should each assist in the preparation of the vine, taking each our turn at mashing the vine. This he placed in a large kettle, added the chakruna leaves and water, placing the mixture upon the fire to cook down for hours upon hours until what was left was the cream-and-coffee colored brew we would, later that night, drink. Mid-afternoon I was sitting at the edge of the river, gazing into the clouds, the greenery; the flowing eddies of the river, silent, alone. Angelina, a vision of uncomplicated oneness with her environment, was walking towards me. About 5 feet tall, late 50’s, her black hair cut straight with bangs across the forehead, dropping down to her shoulders behind. Satin blouse, ruffled collar of bright yellow, and the body of the blouse an equally bright blue topped a skirt of black cotton. Her bare feet gripped the earth as she walked up to me, halted, and asked “Triste?” (“Are you sad?) My immediate response was about to say, “No, I’m not sad.” But something in the way her question touched me awoke within me the realization that I did, in actuality, carry a deep sadness within me. “Yes.” I answered. She placed a hand gently upon my shoulder and, smiling, said “Tonight, we will sing the sadness from you.” I sat there stunned in her powerful and innocently direct approach. As evening approached we all laid down to catch a nap in preparation for the intense work of lying down all night. Journeying is hard work. And besides, semi-fasting for three days was getting a bit old, so we slept during the time when normally we would be eating. A light rain woke us, along with the timely screeches and hooting and howling of the jungle come alive at night. Carlos was already setting up his altar, waking bodies shuffled and scooted into sitting position. This night was to unfold somewhat differently, though we did not know it at that time. Following the opening prayers and drinking of the gourd of Ayahuasca that Carlos offered, we all lied down as normal. My intention was set upon ‘Being in Presence’. As soon as the Ayahuasca began working its way within me I plunged into the dark recesses of my Soul. Swirling, twirling about/within me were the images of fantasy that I held onto. Fantasies of relationship, of how life could be, fantasies about all aspects of life. As each one swirled, it moved closer into my field of experiencing it, not just observing it. And as I experienced each one, one after another after another, they got really boring, so hollow and ungrounded were they. “I’m done with them!” I shouted into the vast realms of my own inner Being. And with that they all dissolved like a mist before the morning sun. A feeling of peaceful acceptance coursed through me. Presence of Being. The absence of fantasy indulgment. Got it! As I lie there, floating in the peace, I was also, simultaneously, clearing my Soul of extraneous beliefs and judgments that pervaded my everyday life. Some of these took me into the hidden corners of my feelings, words of injury spoken by and spoken to me. In the background I heard Angelina and Carlos singing in unison as they moved about the tent, sitting over each supine form, singing their icaros of healing for each one. Soon they came and sat by me. Carlos lit his pipe of native tobacco and puffed, blowing the smoke all over my body. Angelina giggled, speaking to her husband in their tribal tongue. He spoke with her, I could tell, without knowing their language that they were consulting, diagnosing and setting the direction they were about to take with the healing they were about to invoke on my behalf. Leaning over me, singing in a high and sweet voice, Carlos’ song carried me as if upon the wings of a beautiful bird, soaring and diving through the cracks of my Being. The sadness that Angelina had evoked earlier that day came swelling up like an immense tidal wave, crashing over my entire consciousness. And as they sang, it lifted, lifted, and then was gone. An increase of light and pleasant feeling flooded my every cell. Then once again I was plunged into the crevices of my life. Only now, it was the issue of my health, my liver in particular, that was jarring me. And again their songs carried me, gently flew me, into a place of such extraordinary beauty and peace that to this day I can close my eyes and it is present. It is the ‘Place of Healing’. And in this Place of Healing I was submerged, drowned in its purity, surrendered into its grace. And as the couple finished their song a great sigh of relief came, unbidden, from the depths of my essence. Again, Angelina giggled, then spoke to me of being happy. “Carlos” I spoke aloud, “Angelina. Gracias para todos (Thank you for everything. ).” They both spoke words of understanding my appreciation, in that wonderful chuckling way that they have. As I drifted back into the nether realms of bliss and exaltation I had the stray thought of realizing that my liver was no longer hurting. Nor has it hurt a single day since that night in November. My liver is, as far as I can tell, healed. Night became day somewhere between the journey and slumber. We all rose early the next morning. Not because we were breaking camp, but because, after these last days of minimal eating, we were famished and could now eat to our body’s desire, as we had completed the three nights of the Ayahuasca ceremonies we had come for. Roberto then went to the boat and reappeared with a very large smile beaming across his face, and a wriggling burlap sack in-hand. He told us how last night he was fishing when something large tugged his line. When he pulled it in, there was an anaconda snake that had eaten the fish he was using as bait. Holding a big stick in one hand he dumped the bag and a coiling, writhing anaconda slithered from the sack onto the ground. Roberto nudged it with a stick to get it moving away from himself. We all ooohed! and aahhed! with delight, as the anaconda is synonymous with the sacred serpent of our nightly visions. About ten feet long and a good 5 inches in diameter, the snake was a young one. The anaconda headed into the banyan tree. Roberto gently guided him back into the camp area so we would have time to get photos and get a closer look at it. After a bit, not wanting to keep the snake from its destiny, we watched as it slid into the river, undulating as it swam across into the mangrove forest on the far side. What a beauty to behold!